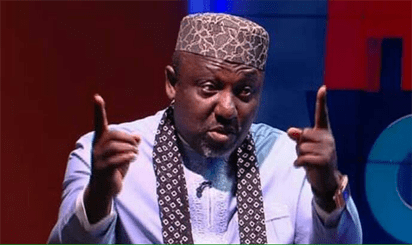 The All Progressives Congress (APC), has said that it will not intervene in the refusal of the Independent National Electoral Commission (INEC) to issue Certificate of Return to the governor of Imo State, Rochas Okorocha as the winner of the Imo West senatorial district. APC’s National Publicity Secretary, Mallam Lanre Issa-Onilu, made the disclosure while fielding questions from newsmen at a press conference in Abuja, stressing that he (Okorocha) remained suspended by the ruling party. He also reacted to the protest that the ruling party should have suspended the Minister of Transportation, Rotimi Amaechi, over what many considered anti-party activities in his involvement in the yet-to-be-concluded Rivers State governorship election. “On the refusal of INEC to issue Certificate of Return to the governor of Imo State, Rochas Okorocha, who was announced the winner of the Imo West senatorial ticket, this party cannot take any action. Don’t forget that he is on suspension. “As far as this party is concerned, that situation remains and there is no way we can say that somebody is on suspension and still go ahead to intervene in his case. In any case, he has not even come up to inform the party of his problem because he must have realised that he is on suspension. Therefore, if the suspension is vacated, the party will now step in to intervene as a party member who has a problem to resolve,” he said. Reacting to Amaechi’s activities in Rivers, the ruling party’s spokesperson said: “On whether what Rotimi Amaechi did in Rivers governorship election amounted to anti-party activities, I will emphatically say no because if you liken it to the situation in Imo and or Ogun states, it will be wrong. “In Rivers State, APC does not have any candidate and as a party; Rivers State is very important to us. The state has been in the hands of pillagers for too long. If we have the opportunity of working with a party willing to abide by our principles, then it is within our right to work with such a party to ensure we free the people of Rivers State from the locust. “In this case, he has not abandoned a particular candidate that belongs to the APC for a candidate of another party. They are entirely different issues and in that case, there is no anti-party. Whatever Amaechi has done is completely normal and acceptable to this party as far as working with other party is concerned,” he said. Onilu equally assured that the ruling party will not spend the next four years blaming the PDP for any failure, explaining: “On our plans in the next four years to avoid blaming the opposition party, let me tell you that we were faced with a PDP one leg in the last four years, which continued to give the country too much problem. “We limped all over the nation in a very dangerous manner. Nigerians, on their own, have cut off the remaining leg, making PDP a forgone issue. The actions we are taking in earnest is to ensure that those pitfalls that came from that limping PDP which made the National Assembly be in rivalry with the executive for the last four years will not happen again. We will not have reason to complain again. “However, despite the challenges, this party has achieved in the past fours, with little resources, more than the entire 16 years of PDP put together even with huge resources at its disposal. We will take Nigeria to the next level. We have survived the PDP and the stage is set for us. We are welcome to the new Nigeria,” he said.